It’s finally fall in Tucson, and that means peak butterfly season and peak blooming time for many of our beautiful butterfly plants, such as the passion vine. While it doesn’t provide nectar for butterflies, the passion vine is the sole food source for the caterpillars of the showy Gulf fritillary butterfly. Three passion vine species are native to Arizona: Passiflora arizonica, Passiflora mexicana, and Passiflora bryonioides. A fourth species, Passiflora arida, is a native of the Sonoran Desert in Mexico that has spread into Arizona (it’s sometimes erroneously labeled in area nurseries as Passiflora foetida). The hands-down favorite with the fritillary caterpillars is the robust Passiflora caerulea, a South American native that is more readily available in local nurseries than the others. Growing several of these plants will provide plenty of foliage for the hungry caterpillars and increase your chances of actually getting to see the plant in bloom. And what an incredible blossom it is—with a history to match. The legend of the passion flower began around 1550 when Cieza de León, a Spanish conquistador, returned home from Peru with the granadilla plant, now thought to be Passiflora ligularis. A Spanish physician, Nicolás Monardes, published an account of the plant in one of his herbals and suggested that the plant’s flower structure could be viewed as a representation of the crucifixion of Christ. The flower became a useful visual tool for instructing converts in the New World, and as time passed, the details of the flower’s correlation to the Passion became ever more elaborate: the flower’s ten petals and sepals represent the ten apostles who were present at the crucifixion; the stalk rising from the center of the flower (the androgynophore) is the column where Christ was tied and lashed; the filaments that encircle the stalk represent the crown of thorns; the five anthers signify the five wounds to Christ’s torso, hands, and feet; and the three stigmas represent nails. (This is an abbreviated version. There’s MUCH more.) In 1737, Linnaeus named the genus Passiflora, or Passion flower, thus enshrining the religious association in the plant’s name. 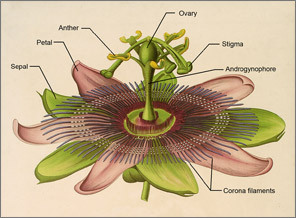 Beginning in the late 1700s, colored illustrations of exotic passion flowers were published in the many botanical and gardening periodicals of the day. Catering to the public’s enthusiasm for the unusual plants, gardeners and nurserymen began the propagating and hybridizing the flowers for European gardens. Today there are some 600 species of passion flowers and more than 700 hybrids and cultivars. 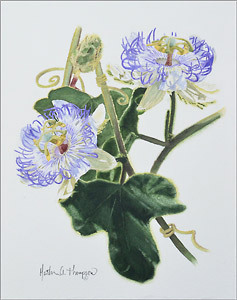 Shown here alongside the structural diagram of a typical passion flower is a watercolor of Passiflora arida by Tucson artist Martha Thompson that was included in the Florilegium Program’s 2013 exhibit, Botanical Art of the Sonoran Desert: Past & Present. Martha was born and raised in the Port of Guaymas, Sonora, Mexico. After graduating from high school, she was granted a scholarship to the United States that brought her to Tucson to learn English as a second language. In 1995, she married and returned to Tucson where, in 2001, she took her first art class through the Pima County Parks and Recreation program. As a developing fine artist, Martha was influenced by her friend and mentor Larry Wollam, who helped her develop the knowledge and love of graphite and watercolor techniques. Nature has become her most enjoyable and inspirational subject. This appeared in the October 2016 issue of The Desert Breeze, the monthly newsletter of the Tucson Cactus and Succulent Society.